PORT ELIZABETH, (Reuters) – Zimbabwe were bowled out twice yesterday as South Africa swept to an easy victory by an innings and 120 runs as the inaugural four-day test finished inside two days at St George’s Park. Zimbabwe were dismissed for 68 runs in their first innings and then 121 in their follow-on in reply to South Africa’s 309-9 declared. The one-off test ended inside five sessions as the gulf in ability between the two neighbours was cruelly exposed. 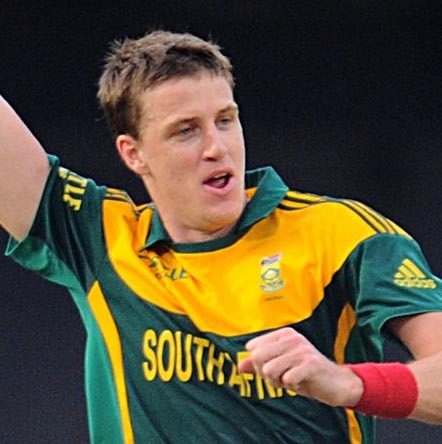 Morne Morkel was the destroyer-in-chief in Zimbabwe’s first innings with figures of 5-21, as nightwatchman Kyle Jarvis top scored with 23 off 50 balls. Debutant Ryan Burl, who added 16, was the only other Zimbabwean batsman to get to double figures. Zimbabwe, who are bottom of the 10-team test rankings, started the second day reeling on 30-4 after being put into bat for the last hour of the first day of the first day-night test played in South Africa and struggled with the pink ball in unfamiliar conditions. They did show some resistance at the start of their second innings but once their first wicket fell on 51, when Chamu Chibhabha was caught behind, there followed a steady procession of batsmen to the crease as Keshav Maharaj took 5-59 and Andile Phehlukwayo returned figures of 3-13. 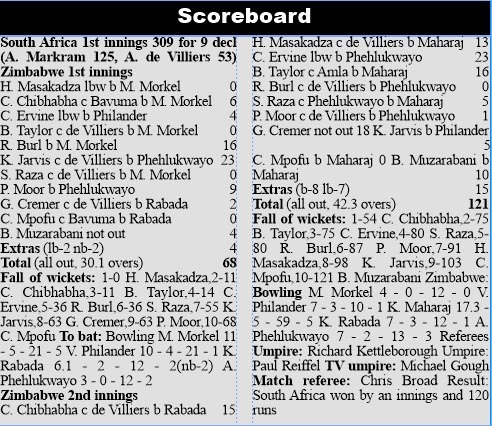 All Zimbabwe’s second innings wickets fell in a single session between the tea and dinner break. Craig Ervine was their top second innings scorer with 23 runs. “I don’t think we were overwhelmed but it was a surprise to us to see the ball move around like that. We didn’t assess conditions that well,” said visiting captain Graeme Cremer. South Africa won the toss and batted first on Tuesday with Aiden Markram scoring 125 and AB de Villiers 53 on his return to the test arena after a hiatus of almost two years. “The bowlers were exceptional on a very spicy wicket but we still needed to do the basics well and we didn’t miss our mark very often,” said De Villiers. The four-day test is the first since the International Cricket Council tweaked regulations to give some of the weaker nations a more sporting chance, in the wake of Afghanistan and Ireland being granted test status. The one-off game against Zimbabwe was also supposed to provide the home team with preparation for their three-test series against top ranked side India, which begins next week. But it was much more of a one-sided contest than originally expected and will have provided neither side with any meaningful experience.